Rest—and pack—easy, no matter where you’re headed. This small travel pillow is half the size of standard ones, and has a comfortable stretch band that keeps it in place while you sleep. Bonus points: the band also serves as a carrying handle, and transforms the pillow into an eye mask. We travel six hours one way every week or ten days. Hubby drives and I often sleep. This has made my life very comfortable! A Travellers Dream Come True!! Voyage Pillow is a traveler’s dream. 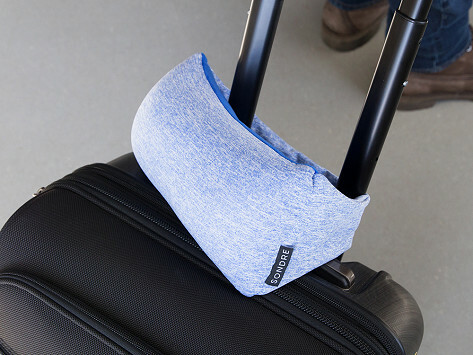 The small travel pillow is about half the size of a standard U-shaped pillow, so it fits easily in a carry-on bag. It’s stuffed with thousands of sculpting microbeads that conform to your head to provide comfortable support, and the plush interior is soft against your skin. The pillow’s stretch band helps keep it in place (like around a head rest) and makes this pillow more versatile to suit your preferred sleep position—against the window, or resting your head in your hand. It lets the pillow act as a light-blocking eye mask, too. Maker Matt Benedetto is a travel minimalist. He packs just one carry-on bag for every trip, no matter how far-flung his destination. He appreciates that what goes in that one bag has to be essential. We think Matt can rest easy knowing that the Voyage Pillow is exactly that.